We have a privileged location in the center of La Serena City, where you can find different places to visit and activities to do. We are situated near places of interest like museums, theatres, markets, service areas, bars and restaurants,daily activities and surrounded by shopping centers with everything you need,. you have to stay in the downtown area .if you want to be arround malls and stores, its a good idea to stay close to the bus terminal but if you want to live an aventure in our city, come and meet our culture and meet new people from other parts of the world and have a good time experience so choose Hostel Cosmo Elqui as a place to stay. 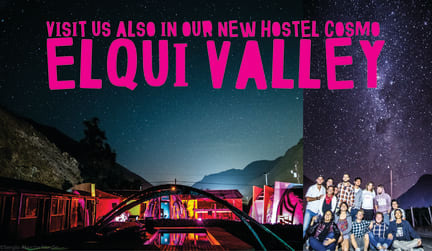 - Staying in Cosmo Elqui Hostel is an experience shared amongst friends, you will never feel alone, unless that's what you want. - We arrange activities so you can meet other guests and ensure a fun experience in the city. - After checking out, you can still use our common areas until 11:00pm. - We guarantee fun and rest: Resting areas are so apart from common areas that you can easily rest in our spacious bedrooms and comfy beds. - We can help you booking tours: With our help along with experiences with our guests, we can assist booking touristic experiences so that your trip is truly memorable and avoid inconveniences. - We have secure storage: You can leave your backpack with us up until 11:00pm after checking out. - Enjoy the city on wheels: You can rent one of our bikes and tour around the city and the beach. - We are the only eco friendly Hostel in town: We recycle all of the glass bottles, we reduced 70% of electrical consumption by using LED bulbs and we only use 30% of running water compared to normal consumption, this is key since we are located within a dry zone. - We always have the best mood since our staff is composed of young creative and enthusiastic people. 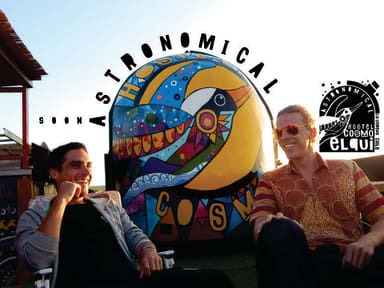 - We will opening our beautiful astronomical experiences terrace! This will enable you to know part of the attractions of the "Star Region". Check in at 13:00 (to the dorm) / ANYTIME to the hostel, if you let us know by advanced. I was so sad to leave this hostel after 3 nights, it's amazing! They organize activities every night (if you're lucky to end up there on the weekend, you'll have fun! ), but it's still quiet enough if you just want to chill out. The staff is so friendly, easy to talk to, the breakfast was all that you could ask for - they even gave us some chocolates on Easter :) I wanted to stay there more just for the hostel! So no doubt if I ever go back to La Serena I would definitely stay again. Nice and clean, we had the double private room with private bathroom. Possibilities to book nice tours from the reception!